What do the different charm bracelets look like? Perhaps the best know charm bracelet is the Classic Silver Pandora Bracelet, Pandora currently only make one style of metal charm bracelet. Pandora is completely round bracelet which flexes but due to its metal memory it will always return to its original shape. It fastens to the wrist by bending the bracelet and twisting over the wrist, then simply fasten the clasp. 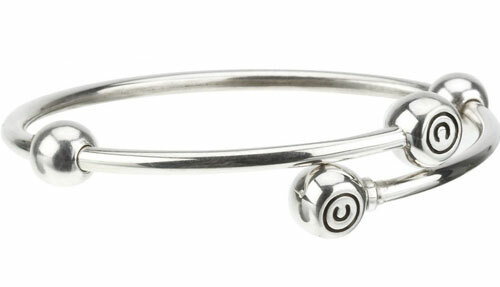 The charms on Panodra bracelets can sometimes slip around towards the clasp. We recommend these silicone stoppers which can be purchased separately, these can be moved around to keep your charms where you want them. Chamilia make two different styles of charm bracelet, the original flex bracelet and the new brilliance bracelet. The Chamilia flex has 2 spring loaded end caps that come off by pushing and twisting. 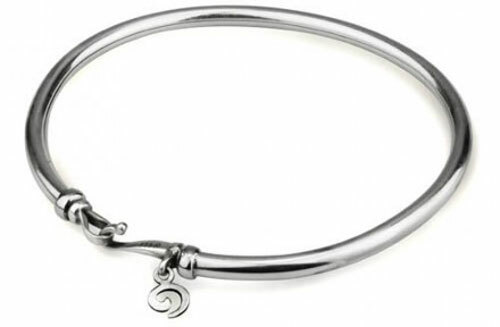 The bracelet comes with 2 movable silver stoppers which allow you to wear all your charms at the top of the bracelet so as not to catch on things under your wrist. Alternatively you can remove them to allow your charms to move freely around your entire wrist. 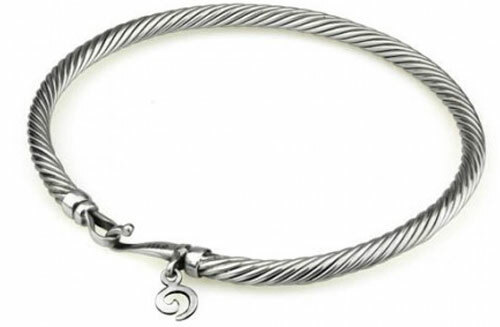 The bracelet is put on by simply twisting it on. 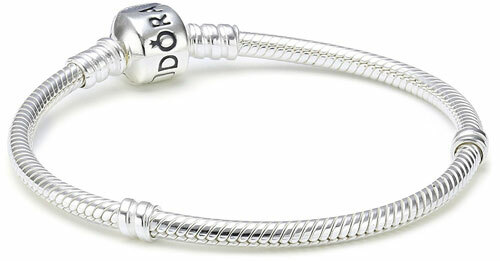 Trollbeads currently only make one style of metal charm bracelet. 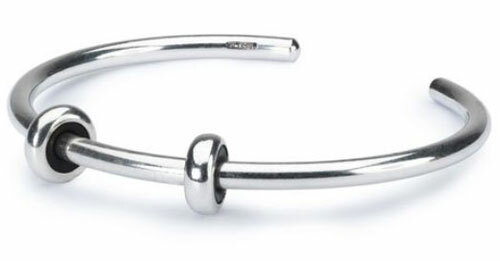 Trollbeads bracelet is a solid silver smooth bracelet that simply slides over the wrist, it has a stopper at either end which should be supplied when you buy your Trollbeads bracelet however they are available separately here. The bracelet is rather expensive compared to the others because the bangle itself is solid and not hollow like the others. Ohm make two different styles of charm bracelet, the Smooth Bracelet and the textured Twist Bracelet. 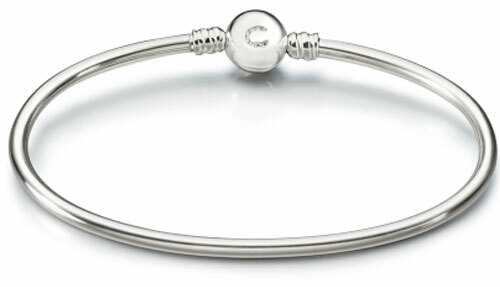 The smooth bracelet from Ohm is an oval bracelet very similar to the Chamilia, the metal also has metal memory meaning it will spring back to its original shape after being bent or twisted. The clasp on the Smooth Ohm Bracelet is very easy to use as it opens by simply squeezing it and closes in a very similar way. The Twisted Bracelet from Ohm has all the same features as the smooth bracelet however the main part of the bracelet is made from twisted metal rather than smooth metal. It has the same easy to use clasp making it very easy to put on and take off. Trollbeads have the smallest hole which means that ALL beads are compatible with the Trollbeads bracelet. Pandora has threads on the end and so can only be used with large core beads. Chamiia flex are very similar to Trollbeads and so all beads are compatible. Chamlia Brilliance has the same threads as Pandora so is not compatible with the smaller Trollbeads but is compatible with Pandora beads. The persona bracelet has no threading and so is fully compatible with all brands. Both The ohm bracelets has a small end cap which makes it incompatible with the smaller troll beads.